It's that time of year again. Yay for Halloween because it means I can go all out in my nail art! I'm also looking forward to showing you all the awesome halloween inspired polish collections I got! I don't know if a month is long enough! I have so many amazing plates too. It's really gonna be a push but let's try to do a lot shall we? Today I have one of my favorite new brands to show you to kick things off Liquid Sky Lacquer which I spoke about in my floral appeal post. I have a LOT of Carolyn's polishes. I ended up going for the whole Halloween collection as well as it was seriously gorgeous. To start things off I thought I show you some simple candy corn inspired nail art. 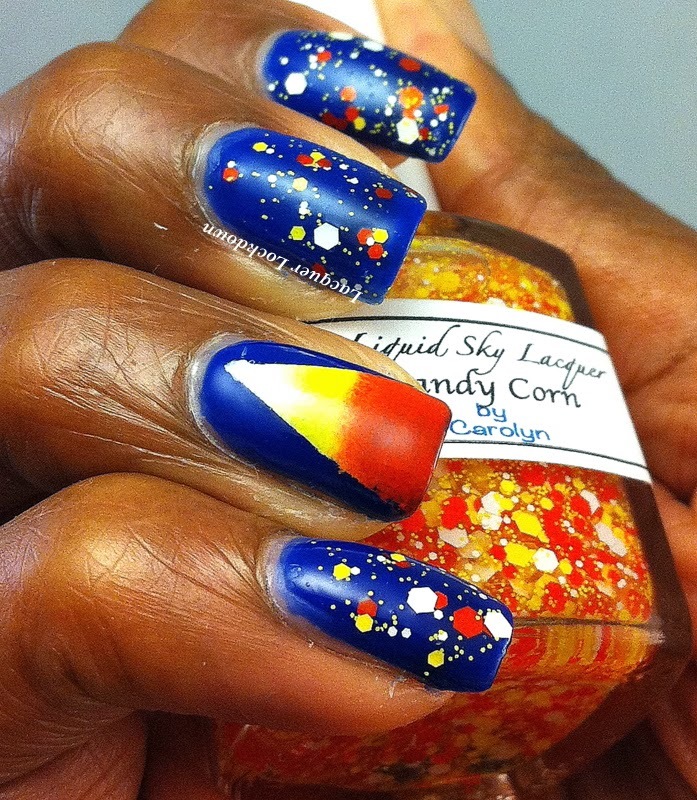 Candy Corn (the polish) is pretty much exactly what it sounds like matte white, yellow and orange hexes of varying sizes with yellow microglitter in a clear base. It took me a while to figure out how I wanted to wear this and ultimately I found myself reaching for my tried and true brand - Essie. Lol hardly surprising, but I chose one of the jellies from the summer collection, Bouncier It's Me because it provided a nice contrast for the glitter. Bouncier It's Me! Perfect blue jelly. 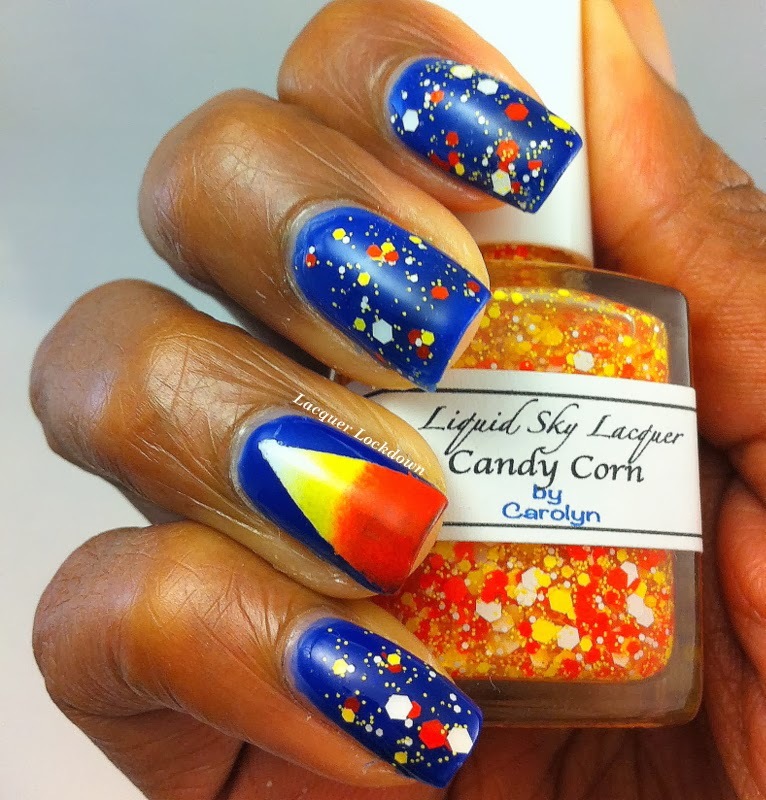 I created a simple candy corn image across one nail as the accent and there you have it! My first Halloween mani of the season. I am not sure if Carolyn will be restocking the Halloween set again but the store reopens on October 8th so you can check it out to see if they will be available my guess is likely yes since she's very good about keeping her shop stocked. 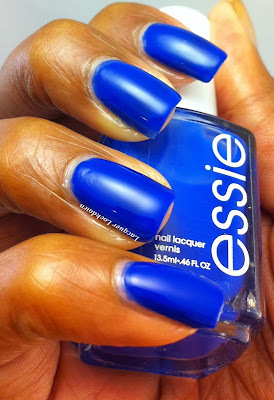 I hope you enjoyed this simple mani cause it's only going to rev up from here! Thanks for reading and see you next post!